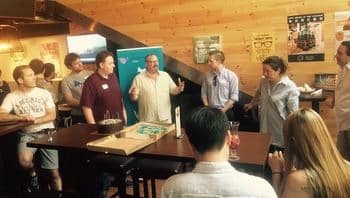 On June 11, 2017, Democrats Abroad (DA) members in China gathered to celebrate the first elected leadership team and pay tribute to the contributions of members saying farewell to China, including Ada Shen, Rich Welch, Erin Campeau, Christine Pernin, Radha Chaddah, and Avery Ince. DA China Vice Chair Samantha Wong presents a cake to Rich Welch, Ada Shen, and other members to thank them for their years of hard work. This celebration included DA members - new and old - and was held in Beijing. Some members even traveled in from other cities in China to participate in this inaugural event. Also in attendance from Hong Kong was Shaun Barnes, DA Asia-Pacific Regional Vice-Chair. The official DA China logo on display for the first time on posters and t-shirts. The occasion was marked by farewell speeches from our friends Ada Shen and Rich Welch, both of whom have plans to leave China. They spoke to the gathered members about their hopes for the future of DA China and offered their continued support especially to the incoming leadership. DA Asia-Pacific Regional Vice-Chair Shaun Barnes and DA China Chair Aaron Kruse also shared remarks expressing their enthusiasm and optimism for the start of the new China country committee. From left: DA China members - Joseph Good and James Bernard, DA Asia-Pacific Regional Vice-Chair - Shaun Barnes, Rich Welch, DA China Chair - Aaron Kruse, and Ada Shen. Both Ada and Rich helped usher the membership through the process of establishing a country committee for China within the global Democratic Party Committee Abroad (DPCA) structure. They laid the groundwork for the incoming leadership team -- communicating with the DPCA about requirements, proposing bylaws, notifying members, and so much more. They organized the election for DA China leadership on May 6, 2017 with gatherings in Beijing and Shanghai, and connected by WebEx to allow members in other locations to participate remotely. Finally, Ada and Rich, along with DA China leaders Aaron Kruse (Chair), Samantha Wong (Vice-Chair), and Randi Miller (Legal) traveled to Washington, DC to attend the Annual DPCA Global Meeting, witnessing the official vote to admit DA China on May 15, 2017. Ready to Join Us? 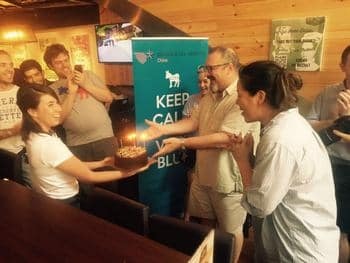 You can become a member of Democrats Abroad China online. Membership confirmation will include an invitation to join us on WeChat.